Dental health check-ups and cleanings at the beginning of the school year are important for your child’s overall health and success at school. Dental health problems can have a negative effect on a child's ability to concentrate in school, as well as their ability to eat, speak and play. They can also result in many hours of missed school. Issues like cavities and gum disease can cause a great deal of discomfort and even pain for children and disrupt their daily lives. Schedule a dental check-up and cleaning at our Abbotsford dental office at the start of the school year, so that your child’s dentist can make sure their smile is cavity-free. This will set them up with a bright, healthy smile for the new school year! Review your child’s at-home oral hygiene routine. Make sure they are brushing for a full two minutes twice a day, and flossing at least once a day. Ask your child’s dentist to provide tips and advice for improvements, such as adding mouthwash or fluoride toothpaste. Be sure to pack lots of nutritious options in your child’s lunch bag. Limit sugary treats, and include lots of fresh fruits and vegetables, as well as calcium-rich foods like cheese, milk, and leafy greens. If your child plays sports, a custom fitted mouth guard is an important investment in their oral health. A mouth guard will protect your child’s teeth, jaws and cheeks from injuries that may result from an impact during a game or practice. Clayburn Dental in Abbotsford will create a custom fitted mouth guard made from a mold of your child’s teeth, meaning it will fit securely and comfortably, and provide optimal protection. 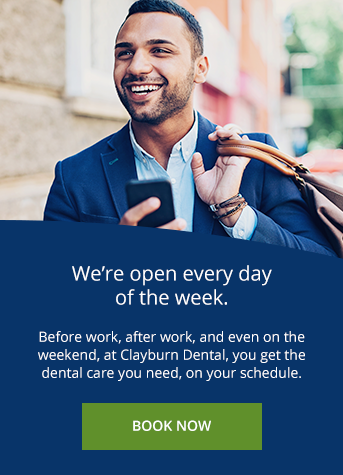 For more information about children’s oral health, contact the dentists at Clayburn Dental in Abbotsford today!